Need help setting up an IRS payment plan? Got questions about delinquent taxes? Struggling with IRS tax levies? Is your state taking against you for taxes? No one should have to face tax problems alone. 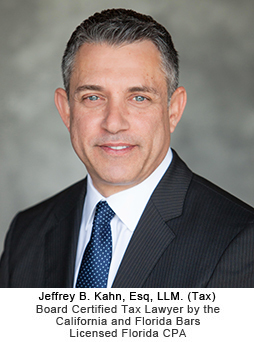 Contact the Law Offices Of Jeffrey B. Kahn, P.C. for responsive, proactive legal assistance with a wide range of tax issues. When you contact a California tax lawyer from our firm, you can pursue the best possible resolution for your income and assets. With three locations around the San Francisco Bay area and four locations in Southern California, we’re easily accessible to Northern California and Southern California area residents. For those who are located outside of these areas, we’re accessible as well. Whether you need a tax attorney in San Diego or San Francisco, we can be reached using any of our local telephone numbers or toll-free telephone number below. We look forward to hearing from you!